Oscar's 'In Memoriam': Where was Farrah? The "In Memoriam" section has become an awards show staple: tasteful music played under images of the past year's notable dearly departed in that particular industry. There will always be disagreements over the length of the piece, who rated highest on the "death-meter" with the most applause, the music (I'm a huge James Taylor fan, but I heard from people who thought his rendition of "In My Life" was inappropriate or otherwise off) ... and most of all, who is included and who is left out. I knew Mark Boal before 300 million people met him last night. 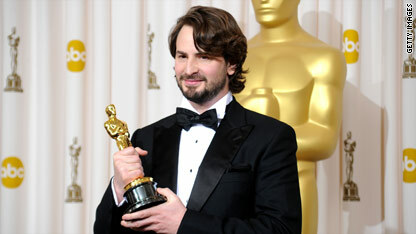 I'm not trying to brag here, but I'd like to point out that 16 days after I interviewed Mark Boal, he won two Oscars for writing and producing "The Hurt Locker," his low-budget, character-driven movie about a bomb disposal team in Iraq. He said all the right things that a candidate for an Oscar says. "It's pretty great. It's pretty thrilling I would have to say. It's the highest honor you can get in the film business. So to be recognized by your peers like that, it's a really wonderful thing," he told me. "Jimmy Kimmel Live's" post-Oscar show - aside from giving us Robert Downey, Jr. and the new "Iron Man 2" trailer (I'm so there!) - presented another star-studded comedy sketch that followed up on "I'm F-ing Ben Affleck," the viral sensation from two years ago (which was preceded by then-girlfriend Sarah Silverman singing the same about Matt Damon). Kimmel called "The Handsome Men's Club" to order, whose members included Affleck, Matthew McConaughey, Ethan Hawke, Rob Lowe, Ted Danson, John Krasinski, Taye Diggs and many more. However, much controversy ensued in the Club over Kimmel's status as a "handsome man," and it featured not one, but two surprise endings. This is starting to become a post-Oscar tradition, and it certainly gives Kimmel some notoriety, attempting to make these viral videos. It went on a little long for my taste, though the last minute or so made it all worthwhile. Check it out and let us know what you think of it. Does it measure up to the genius of the previous Damon and Affleck videos? Did a producer pull a 'Kanye' at the Oscars? Program note: It was called the “Kanye” moment of the Oscars. Hear director Roger Ross Williams explain the controversy behind his acceptance speech for best documentary short and why he was interrupted. "Larry King Live," 9 p.m. ET Tuesday. 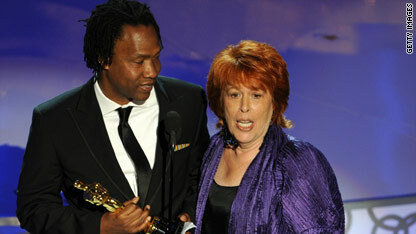 The win for best documentary short took an odd turn when the film’s producer, Elinor Burkett, grabbed the microphone away from director-producer Roger Ross Williams during the acceptance speech. Burkett told Salon.com that the pair have had some issues which she said resulted in Ross no longer speaking to her and her being shut out of events surrounding the Academy Awards. A funeral for the 18-year-old son of Marie Osmond is scheduled to be held at noon Monday near Provo, Utah, a publicist for the entertainer confirmed to CNN. Michael Bryan died on February 28. 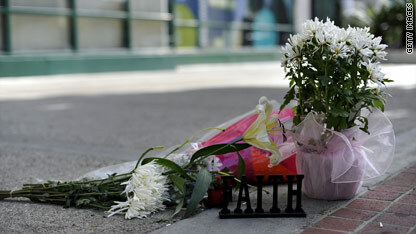 His death was classified as a suicide by the Los Angeles Police Department. The young man had formerly gone by the last name of his father - Blosil - but his legal name at the time of his death was Michael Bryan, said Alan Nierob, Osmond's publicist. In between eating spectacular McDonald’s fries in Culver City and applying for jobs at office suppliers and home improvement stores, former “Tonight Show” host Conan O’Brien has been busy turning an everyday Twitter user into an overnight celebrity. Sarah Killen, 19, was enjoying peanut butter, gummy candy and her general button-y loveliness in relative Twitter obscurity until O’Brien decided that she would be the first person he would follow on March 5. Within 24 hours, Killen, also known as @LovelyButton, was an Internet star. At the time of this posting, her followers had swelled to more than 16,000, and the girl just started tweeting in late February.